... you can make something a little more presentable. Yup, this baby is about as pupose-built as you will get. 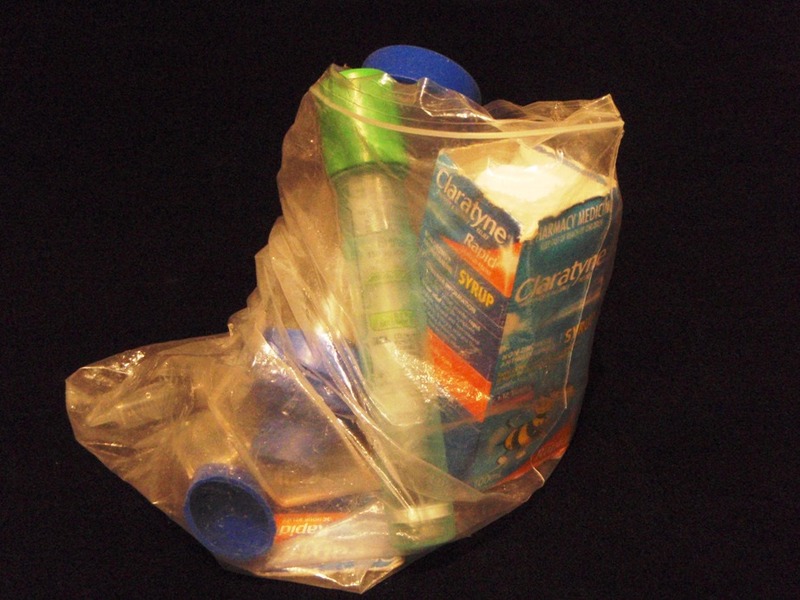 I'm calling it the this-is-a-little-or-really-big-emergency-allergy-action-bag. It fits an EpiPen adrenalin shot, liquid antihistimine, ventolin inhaler, spacer and mask. Its all for Bargy's benefit. He was diagnosed with some allergies just after he turned one. I'd been thinking about the bag for a while, but needed to steel myself for sewing with vinyl. Its not something I have tried before and am unlikely to repeat in a hurry. I lost some of the pieces as I was cutting (looking for that clear stuff is like looking for the invisible man). The leather needle I used on the sewing machine kept making alarming clack-clack noises. The vinyl kept sticking to the sewing machine like a limpet, necessitating the use of brute force whilst stitching. All the while, as I sewed, I was listening to Gordon Ramsay's show The F Word in the background. Trust me; on this particular occasion, that man really couldn't hold a candle to me in the swearing department. Truly, there will probably be a senate enquiry into lounge-room language after sewing vinyl. Anyway, its all finished now. And I managed to use up one last little piece of Pippijoe's Daisies fabric as a decorative feature. At least that behaved nicely whilst sewing. We are off to the Children's Hospital tomorrow where Bargy will have some tests to see how he is going. I'm kind of hoping that making this little bag right before his hospital appointment will be like taking an umbrella on a trip away from the house. Its guaranteed not to rain when you carry an umbrella, right? sewing vinyl is a pain but if you get a teflon foot - it makes a HUUUUGE difference. Hope the test went well. Best wishes for the appointment tomorrow! Love your pack - it makes great sense to use clear pvc for this project- don't give up it is a great medium to sew with! I hate sewing with PVC...I used to make manufacturers samples for a company that made yoga supplies, and I would have to make all these bags with PVC pockets, and PVC windows, and the whole thing in PVC, etc. Ugh. I usually sew it between two layers of tissue or greaseproof paper. Slide better that way, and then you just rip it off. Classic. I taped the F word, and can't wait to see it. Really love your work and is very creative for such a practical purpose (looks cool too!). You swear worse than Gordon Ramsey? That is some serious language - I love it (and am glad I am not the only one). Wow, you did a great job..I've never tried sewing the clear vinyly stuff before. Hope Bargy goes well tomorrow, must be scary having to carry an epipen around! Just found your blog and I love it! I think the vinyl turned out fantastic. Hope the test for Bargy turns out favourable.